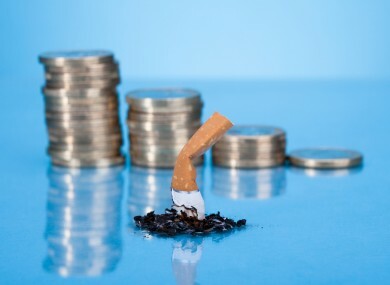 SMOKERS WILL QUIT for around €700 in cash, a new study has found. The US study of CVS Health staff conducted by researchers at the Perelman School of Medicine at the University of Pennsylvania and published in the New England Journal of Medicine enrolled 2,500 staff from across the US for eight months in 2012. The study found that an average of $800 was enough to get workers to kick the habit. Participants were then assigned to one of five groups: individual reward (reward based on individual performance), collaborative reward (reward based on group performance), individual deposit (requiring an upfront deposit of $150 with subsequent matching funds), competitive deposit (competing for other participants’ deposits and matching funds) or usual care (including informational resources and free smoking cessation aids). Of the participants assigned to the reward-based programs, 90% accepted the assignment, compared to just 14% of those assigned to the deposit-based programs. As a result, 16% of those assigned to reward programs remained smoke-free for six months, compared with 10% in the deposit programs, and 6% in the usual care group. Contrary to the authors’ expectations, the group-oriented programs were not significantly more successful than the individual-oriented programs (14% vs 12%). Of the 14% who accepted deposits, 55% were smoke-free after six months. “We found that the reward-based programs were more effective than deposits overall because more people accepted them in the first place,” said lead author Scott D. Halpern, MD, PhD, an assistant professor of Medicine, Epidemiology, and Medical Ethics and Health Policy, and deputy director of the Center for Health Incentives and Behavioral Economics (CHIBE). With such unprecedented rates of success, the trick now is to figure out how to get more people to sign up — to feel like they have skin in the game. CVS Health, which partnered on the trial, will be the first to try out this approach. Based on the study’s results, they will soon launch a campaign called “700 Good Reasons,” in which all employees who smoke will be able to deposit just $50, and if they test negative for tobacco 12 months later, they will get back their $50 plus $700 more. Email “How do you get smokers to quit? Pay them”. Feedback on “How do you get smokers to quit? Pay them”.